Note: This is Part 1 of a three-part series about the Past, Present & Future of the Wedding Industry. To receive future blog posts by email, sign up for this blog. I’m fascinated by how digital innovation and technology can transform a whole industry. Almost every industry has been (or will be) impacted by new technology, and the wedding industry is no exception. Each year in the United States, about 2.5 million people get married. The industry is estimated to be $60 Billion in the U.S. and $300 Billion globally. Here in the U.S., the wedding industry comprises almost 600K businesses that employ about 1 million people. It’s an industry that is growing slowly (about 2% per year) as more and more young people decide to skip marriage altogether. The wedding industry is a great example of an industry in transition, spurred on by digital innovation. Some of the market is stuck in the past with old ways of doing things, while a significant portion of the market has embraced new platforms and technology. Meanwhile, there are dozens of technology and media companies doing their best to push technology to new heights, as they imagine a future where most customers completely embrace digital. I got engaged in 2002. That was five years before the iPhone was introduced, and two years before Facebook was even launched (cue the “gosh you’re old” jokes). It’s stunning to think about all of the technology innovation that’s happened in the last 14 years. The wedding industry hasn’t been immune to digital disruption. Digital has changed how brides find inspiration, modified how a couple finds a venue, and altered the way local wedding vendors and couples connect and negotiate. Change tends to come in small increments, and it’s hard to really say what the future holds. But while some people imagine hover boards and robots, I envision technology that we have today being easier to use and more accessible. For most of us, the year 2002 wasn’t that long ago. And 2030 will be here before long. The future of the wedding industry will be a version of today, but better. In this three-part series, I’ve taken a deep look at the wedding market as an example of how digital has transformed an entire industry. In Part 1, let’s look at the first stages of wedding planning. After a couple gets engaged, the excitement quickly turns into planning mode. They need inspiration and ideas. And since venues and photographers tend to book up early, they also need to find and secure these specific local vendors. A lot of this has changed since I got married and I imagine it will continue to evolve over the next decade. Let’s dive in. Past: When my girlfriend became my “fiancée” in 2002, one of the first things she did was buy a few bridal magazines. It was exciting for her to peruse the pages in search of inspiration, and dog-ear the pages of her favorite dresses and hairstyles. One of our friends had gotten married just the year before, so she brought over about a dozen wedding magazines to add to the pile. These magazines were the primary sources of inspiration — they filled up our living rooms (and our minds) with lots of ideas for our upcoming wedding. Present: Today, women (and more men than ever) seek inspiration online, do research on their laptops, and download the best wedding planning apps to their phones. Wedding magazines are still a popular source of inspiration for ideas, but most millennial brides spend more time online as they plan their wedding. Many magazines (like Brides and Martha Stewart Weddings), have rich content sites that supplement their print offering and are mobile optimized. 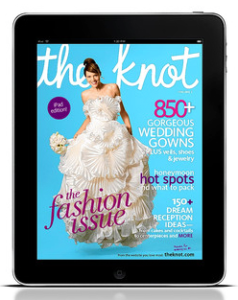 In fact, according to the Knot’s Real Weddings Study, the use of smartphones to access wedding planning websites nearly doubled from 2011 (33%) to 2014 (61%). About 6 out of 10 brides are actively planning their weddings through their mobile device: they research gowns (61% of brides, up from 27% in 2011) and search for wedding vendors (57% of brides, up from 22% in 2011). • Pinterest is used by 64 percent of brides to draw inspiration and help create their big day, and 54 percent of brides use the site to illustrate their vision to planners and vendors according to a BRIDES 2014 American Wedding Study. Pinterest has 38 million boards about weddings that have been created by brides (and sometimes by women not yet engaged or even in a relationship!). • The Knot Wedding Planner is a great app that lets you track guests, manage your budget, organize your to-do list, and get ideas on dresses, cake, decorations, and more. • Weddingbee features blogs from real brides and a community of readers who offer wedding planning advice. The site is updated around 20 times a day. Future: So what will the wedding inspiration market look like in 15 years? As a fan of magazines, I think brides will continue to buy titles like Martha Stewart Weddings, Brides, and The Knot magazine. Over the next decade, I would expect that we’ll see some consolidation in the market, as independent brands like Premier Bride and Wedding Style are acquired by a larger media companies. On the digital side, media companies in the space will fully embrace the idea of ubiquitous, multi-device content and services. Brides will expect to access, edit, and share content wherever they are on whatever device they happen to be using. Wedding sites and wedding apps will become more mobile phone optimized, and take advantage of proximity and location to offer personalized services that best fit the particular bride. And new apps that offer easy ways to store, access, and seamlessly communicate details with everyone involved will be commonplace. The mobile phone will be the center of all of the planning activity, and it will handle it all with ease. Past: When we planned our wedding, my fiancée and I spent several weekends driving around New England to visit potential venues. We saw about a dozen wedding venues of various types. I remember we arrived at a few of them and we knew immediately that it wasn’t a fit (we still had to be nice and listen to their spiel). Several of the venues didn’t match the description we found online. And a couple of the venues couldn’t accommodate the number of people we planned to invite or didn’t allow us to serve alcohol. The whole process was time-consuming as we drove all over New Hampshire (and a couple of places in Massachusetts) to find a venue that we thought would suit us best. • Wedding Wire is a local wedding vendor site that lets couples narrow down their choices by venue type, price, capacity, and other variables. It also provides a great tool that lets you do a side-by-side comparison of your favorite venues. • Eventective boasts 350,000+ venues and vendors for weddings and parties in North America, many of which have reviews and ratings. A “Request Pricing” button enables you to send the venue a quick request for information without having to leave the site. The site also features community forums where couples can post their questions and seek advice about wedding planning. 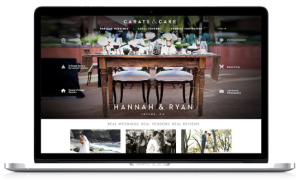 • Carats and Cake enables users to experience real-life weddings nationwide through photos. Weddings include direct links to venues and vendors who have been rated by the couples who planned the big event. Future: Over the next 15 years, wedding venue owners will have more platforms and tools than ever before to create deeply immersive online experiences. By 2030, I expect some wedding venue websites will offer 3D virtual reality walkthroughs so that the couple can “visit” the venue from the comfort of their couch. If you think this is far-fetched, remember that the average venue costs between $10,000-$15,000, so investments in technology are likely to have clear ROI for these small business owners. In addition, as more couples embrace video-streaming for their wedding day, this new video content might be available online for prospective couples. For example, a couple could use a service like Periscope to stream their big day for those who couldn’t be there in-person. Then they can use a service like Katch.me to save this stream and make it available online for others. This kind of “real-life” video content of the venue will provide newly engaged couples with a solid understanding of the venue before ever leaving their house. Past: Almost every wedding I attended in the 90s and early 2000s had disposable cameras placed on each guest table. After guests snapped various photos at the reception, the couples would collect the cameras and drop them off at the local drugstore to be developed. A few days later, the couple would get back envelopes full of these candid shots — none of them high quality, and most of them probably not worthy of being printed. • Eversnap (formerly Weddingsnap) takes guests’ photos and videos and puts them into private online albums. Users can comment on, like, and modify photos through fun filters, and — after the wedding — couples can download their favorites. • Capsule captures photos and videos in online albums, and enables couples to send private messages to guests via group texts and from an email account. 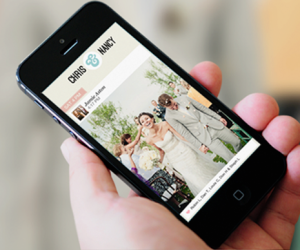 The app is integrated with The Knot, which lets couples see all of their photos directly on their wedding website. Couples also have the option to watch their photos in real-time via a slideshow displayed during their wedding. • Wedding Party lets guests easily share photos from the big event, but it also keeps all of the couple’s wedding details in one place. The platform enables easy communication of important information including accommodations, gift registries, and more. Future: As most of us have experienced, the world of digital photography creates one major problem: too many photos. All of us are so snap happy, but the result of all of that output can be overwhelming. Many of the large tech companies (like Google and Apple) have tried to help organize digital photos, but each solution comes with its own drawbacks. In the future, I expect that real solutions will emerge to better manage digital photo collections. This new technology will help automatically identify the best photos of your collection and create compelling slideshows without much user interaction. I also expect wearable devices and drones to play a role in wedding photo and video capture (like these guys, who do videography by drone). I imagine conspicuous new wearable devices that take high-resolution photography to be part of wedding attire. And if drones come down in price, aerial photography would be a nice addition to the mix of media captured at a wedding. On the professional side, couples will expect more from a photographer, and those who offer additional services (photo montages, video) will stand out from the rest. If I were a wedding photographer, I would make sure to offer new services for weddings. Those who don’t, may risk becoming dinosaurs in the wedding industry. That said, I think more and more couples might choose to forego a professional photographer altogether. Think about this: if there are 100 guests (and a drone) taking very high-quality photos and videos from different perspectives, and there are automated ways to collect and organize them, then what’s the big advantage of hiring a professional anyway? Some food for thought. COMING NEXT: In Part 2 of this series, we’ll take a look at Wedding Registries, Wedding Dresses, and Wedding Websites. Do you have thoughts about this post or about how digital is transforming the wedding industry? Please get in touch! Thanks for taking the time to read.